Oster Self-Basting Roaster Oven Just $38.13! Down From 50! PLUS FREE Shipping! 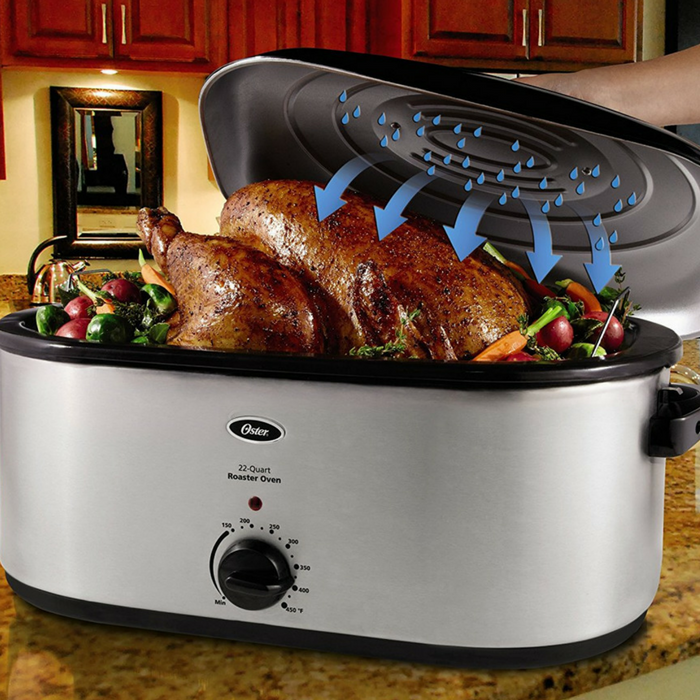 You are here: Home / Great Deals / Amazon Deals / Oster Self-Basting Roaster Oven Just $38.13! Down From 50! PLUS FREE Shipping! Hop over to Amazon to get Oster Self-Basting Roaster Oven for just $38.13 down from $49.96 PLUS FREE shipping! Roasts, bakes and slow cooks to perfection. This Oster 22-quart Roaster Oven is designed with a unique, self-basting lid to keep foods moist, nutritious and delicious. As a self-contained roaster, it uses the steam from cooking to lock in juices, so you can serve mouth-watering, flavorful meals to guests when entertaining. It also shortens cooking time and eliminates the need for constant hand basting. Ideal for preparing big holiday dinners with an 22-quart capacity to accommodate a turkey up to 26 lbs. Makes your kitchen more efficient too by freeing up oven space.